October is National Breast Cancer Awareness Month, which is an annual campaign to increase awareness of this disease, encourage early detection, and support research to find a cure. While we have seen an increase in mammography rates and a decline in deaths there is more to be done. Breast cancer remains the second leading cause of cancer deaths among women, and both men and women should be aware that age, genetics, and family history are factors that can contribute to the risk of developing this disease. The awareness campaign is encouraging individuals to help reduce their risk of breast cancer through regular self-exams, clinical breast exams, and mammograms which are vital since treatments are most effective when breast cancer is detected early. The National Cancer Institute estimates, in the United States, more than 266,120 (female) and 2,550 (male) new cases of breast cancer will be diagnosed this year. Kathleen Cirioli, a two-time cancer survivor, along with Joanne Liscovitz, co-founders of Dance for the Cure, a non-profit organization, have helped local families impacted by breast cancer; with donations totaling over $550,000 since its founding in 1999. Dance for the Cure is a nonprofit organization committed to the prevention and cure of breast cancer and, providing financial assistance to local women impacted by breast cancer. 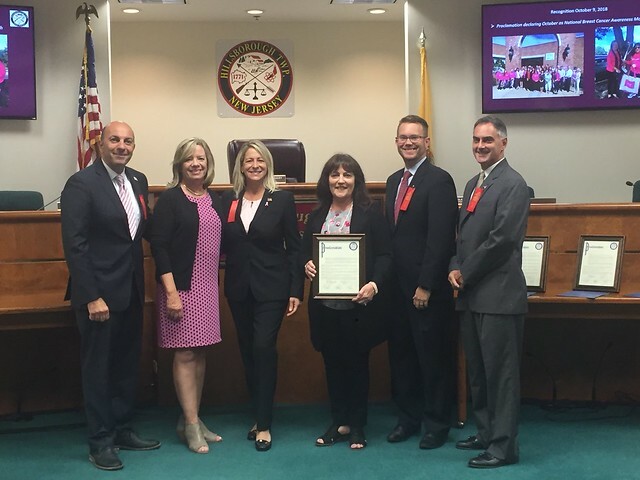 The Township Committee declares October 2018 as National Breast Cancer Awareness Month. We urge all women and their families to increase their knowledge about breast cancer and join us to celebrate successes and memorialize lost battles.